I am very excited to have the ability to re-create my original paintings. This “Wandering Impatiens” is an Archival Digital Fine Art smaller version that still gives that big impact just like the original. It measures 22 1/4″ X 26 1/4 and is hand painted with acrylic paint and just the right size to give a wall that needs something mid-size to fill the space with the bright beauty of nature. The burnished green gold frame has a wonderful etched finish. This is a unique work of art so there is only this one. A Certificate of Authenticity accompanies this work of art. If you have any other questions about this Art contact me directly. Free Shipping in the United States and Canada. Outside this area please call for a quote. The pastel medium requires use many layers so that the flowers look and feel like they are real. This layering technique adds 20 layers to the surface to make sure I have captured the softness of the pink and fushia petals and the lush colors of the leaves creating a beautiful painting. 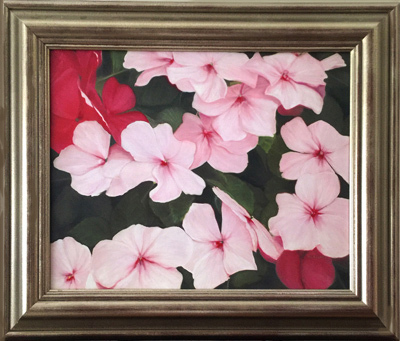 This Framed Archival Digital Fine Art of “Wandering Impatiens” Gold Frame on canvas delicately hand painted with acrylic reflecting the pastel medium measuring 22 1/4″ X 26 1/4″ adding a splash of excitement for any room. Contact me for more information. I would be delighted to talk with you about the re-creations both in the Flowers collection and the Unique Flowers Collection. Remember Free Shipping in the United States and Canada. Outside that area contact me for a quote.